EXCEPTIONAL & LONG-LASTING PERFORMANCE: Run multiple programs at the same time for up to 6 hours straight, with the powerful, yet quieter and cooler Intel Cherry Trail X5-Z8350 processor. The W20 features 10.1 inch 800*1280 HD IPS display screen protects your eyes from radiation. 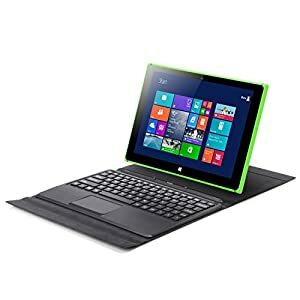 RUNS WINDOWS & OFFICE PERFECTLY: The iRULU Walknbook runs the latest Windows 10, Microsoft Mobile Office (support Word, Powerpoint, Excel) free and features a 2MP front and 5MP rear facing camera to video chat with your friends around the world. HUGE STORAGE CAPACITY: With a 32GB storage capacity (extendable up to 128GB), you will have enough space to save all your personal and work files. With mini HDMI for HD image transmission and type-C port for charging and file transfer, more simple but more multifunctional.